Olive oil may seem like a strange ingredient for a cake recipe, but the end result is absolutely wonderful! It's not so much a combination of savory and sweet; rather, the herbal and earthy olive oil flavor serves as a background element and works as such a great complement to the citrus-heavy (lemon especially) flavors in this cake. Furthermore, you will NOT believe this luscious, moist, decadent cake is low fat! And oh-so-easy to make! The moistness comes from the olive oil in the batter, and only 284 calories and 7 grams of fat per serving are thanks to fat-free milk and egg substitute. Although the cake is dense, it's surprisingly light and springy in texture. The batter will be very thin, so make sure you place a baking sheet on the rack under your bundt pan (to catch any possible leakage). Mine didn't leak out, but there was a little seepage around the bottom edges. It also needed to bake about 20 additional minutes than the suggested 55-minute baking time, but it reached a nice golden brown without being overbaked. Let the cake cool completely, then spread on microwaved (so it will liquify) orange marmalade. The recipe suggests using a spoon to spread it on (I'm not sure why), but a pastry brush works much better and provides an even coating. 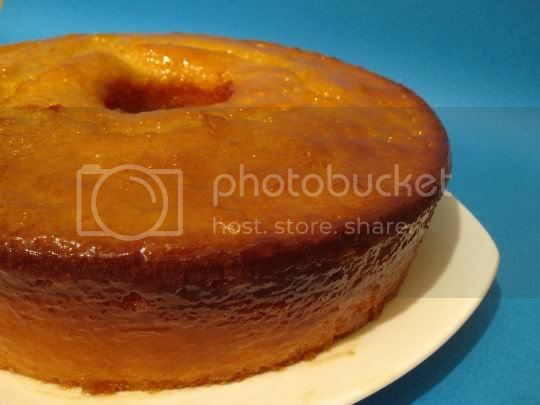 Once dried, the marmalade glaze will sort of crystallize around the edges, giving the cake a nice outer sugary crunch. The bitter, aromatic orange flavor is a great contrast to the sweet lemon. Make again? Definitely! This is a decadent lemon cake with a fun twist.